The World Trade Organisation (WTO) has given the European Union (EU) and others the go-ahead to impose sanctions on the US for its anti-dumping rule. Under the Byrd Amendment, the US has fined companies who dumped goods and then given the money to the companies who complained about the dumping. The WTO has said that the EU and seven other states, including Japan, Canada, and India, can take action. The EU has yet to decide if it will impose sanctions. After the ruling, the US said it would work with Congress to modify the Byrd Amendment, but would remain vigilant on unfair trade. 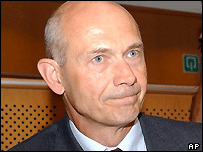 EU Trade Commissioner Pascal Lamy welcomed the WTO decision but gave little clue as to whether the EU would impose sanctions of its own. "This is a decision we still have to make," he said. The Byrd Amendment, introduced in 2000, changed the way that anti-dumping fines were levied by US Customs authorities. Under the amendment, firms which sell below cost price in the US can be fined and the money given to the US companies who made the complaint in the first place. The EU, Japan, Canada, Brazil, India, Mexico, Chile and South Korea have long argued that Byrd Amendment payments to US ball bearing, steel, candle, pasta, seafood and other companies constituted an illegal subsidy. The WTO ruled the Byrd Amendment illegal in 2002. Under the WTO ruling, the EU and the other countries can introduce measures which penalise the US for up to 72% of the monies raised and distributed through the controversial Byrd amendment. The EU's hope is that the threat of penalties may force the US to repeal the Byrd legislation. It may also be able to use the WTO ruling as a bartering tool to obtain concessions in other trade negotiations. "EU members do not really want to impose sanctions"